The NPC Press Freedom Committee panel on whether federal government public affairs offices help or hinder journalism, Aug. 12, 2013. Panelists included Carolyn Carlson, Kathryn Foxhall, Linda Petersen, John Donnelly, Tony Fratto and John Verrico. 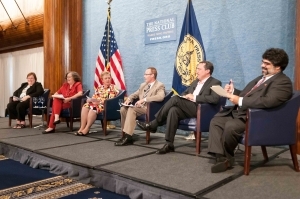 The Aug. 12 event, sponsored by the Club’s Press Freedom Committee and the Young Members Committee, gave NPC members and others in an audience of about 100 a first hand-look at concerns expressed by many journalists covering government agencies that some public affairs officers, or PAOs, have too much control over the flow of information available to the public. Carolyn Carlson, a former Associated Press reporter, assistant professor of communication at Kennesaw State University in Georgia, and author of two surveys on the relationship between public affairs staff and the press, said her study showed that more than 40 percent of public affairs officers she interviewed admitted they “punish” reporters who they believe are biased. John Verrico, president-elect of the National Association of Government Communicators, said many government employees are afraid that reporters will manipulate the information they are provided and that is one reason some agencies limit access to sources other than public affairs personnel. But, “in 22 years of working as a public affairs officer, I’ve experienced only about four times when reporters have intentionally misused information I’ve given them,” he said. Linda Petersen, managing editor of The Valley Journals of Salt Lake, freedom of information chair of the Society of Professional Journalists and president of the Utah Foundation for Open Government, said that reporters will go around public affairs staffers if they feel they are being stonewalled. Both Mr. Fratto and Mr. Verico acknowledge that practice, stressing they expect it. Kathryn Foxhall, a freelance reporter and member of the Press Freedom Committee, maintained that journalists are placed at a disadvantage when the only access they have is to public affairs officers. “Subject expertise is very important to accurate and thorough reporting,” Foxhall said. Both public affairs professionals agreed but said there are often security and market-sensitivity issues that govern press access beyond their offices. John M. Donnelly, Press Freedom Committee Chair and senior writer with CQ Roll Call, moderated the panel. “The net effect of these practices is a real deterrent to people speaking with the press outside of official channels--which often has to happen for the truth to come out, truth that Americans need to know about,” Donnelly said.